North Atlantic right whales began making headlines the summer of 2017 when a record number of the whales died after getting tangled in fishing gear or hit by ships. Before the die-off and since, Dalhousie researchers have collaborated with a number of partners in Canada and the United States to gain as much insight as possible on the endangered species. 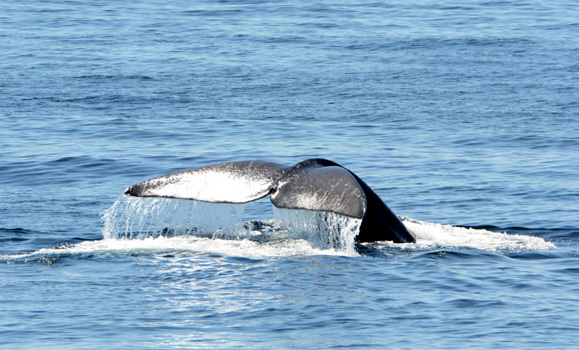 After a significant number of the whales began deserting other habitats off the coast of Nova Scotia in favour of a location in the southern region of the Gulf of St. Lawrence, experts recognized the lack of scientific evidence required to best inform marine management measures in this newly identified habitat. That’s why members of the Whale Habitat and Listening Experiment (WHaLE) team in Dalhousie’s Department of Oceanography have been working tirelessly to fill the knowledge gap. In one experiment this past summer, they helped bring together a number of federal agencies in an effort to collect the most multi-faceted dataset on the North Atlantic right whales yet. WHaLE member Hansen Johnson and Major Dugald Thomson, an Air Force officer with Defence Research and Development Canada (DRDC), coordinated the simultaneous use of underwater robots, marine vessels, aircraft, and military sonobuoys, and satellites over a 1,500 square kilometre area in the Gulf to study right whale activity over the span of two days. The workhorse of the military system used in this study is the sonobuoy. These small, disposable buoys can be dropped from a plane into the ocean where they transmit underwater sounds back to the aircraft. Multiple sonobuoys allow pinpointing the exact location of an underwater sound source — in this case, whale calls. The Canadian Armed Forces typically use sonobuoys to detect, identify and track submarines. Sonobuoys have been used to listen for marine mammals before, but never on this scale or in combination with so many other efforts. 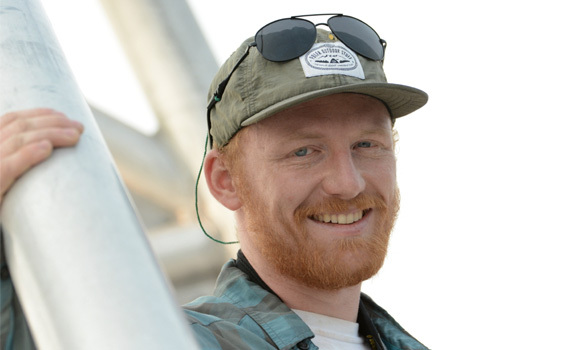 "This collaboration has united a diverse group of talented specialists, each passionate about their respective fields and united by a common goal—trying to understand and preserve these endangered whales,” said Major Dugald Thomson, who is also a PhD candidate in Oceanography Professor David Barclay’s Noise Lab. 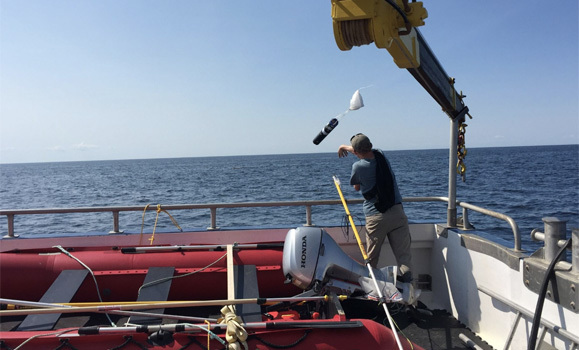 In the two-day experiment, DRDC arranged for Fisheries and Oceans Canada (DFO) scientists to board a Royal Canadian Air Force CP-140 Aurora Long Range Patrol Aircraft that dropped 32 sonobuoys in the southern Gulf. Hansen deploying a sonobuoy on a research cruise earlier this year. At the same time, scientists from the Northeast Fisheries Science Center on board a National Oceanic and Atmospheric Administration (NOAA) plane and scientists from Dalhousie, Canadian Whale Institute and New England Aquarium’s Anderson Cabot Center for Ocean Life on board fishing vessel Jean-Denis Martin surveyed the area to document and photograph the right whales. Below the surface, two autonomous underwater vehicles called Slocum gliders from Dalhousie’s Ocean Tracking Network and the Marine Environmental, Observation, Prediction and Response Network recorded right whale calls and measured the ocean conditions. Above it all, DFO scientists arranged to capture satellite images to map the ocean surface. While Johnson now needs time to comb through all the data, the WHaLE team is aiming to share their results early next year.